The Rhine has covered two thirds of its 1320km long trip from the Swiss Alps (canton Graubünden) to the North Sea by the time it meets a branch of the Hunsrück near Bingen. Starting here, it flows through the slate mountains of the middle Rhine region. The river passes through a very narrow 300m deep ravine where the Hunsrück is a natural boundary. Then it traverses the fascinating landscape of Hunsrück on its way downstream. Following this route the traveller passes through a very attractive landscape on his/her way downstream, alongside the Hunsrück. He sees world famous places such as Bacharach, Kaub, or St. Goar with the overwhelming rock of Loreley. 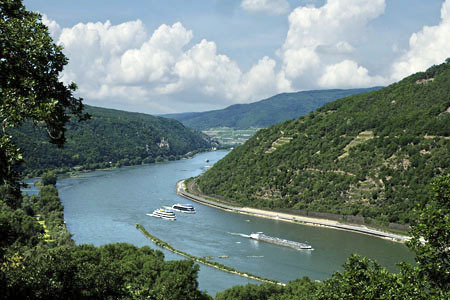 He sees Boppard with its impressive Rhine loop and picturesque Rhens. At Koblenz, at the mouth of the Mosel in the Rhine, he has reached the most northerly point of the branch of the Hunsrück. It is not far from here and the Rhine valley widens, with all the narrows left behind. The low plains now determine the flow of the Rhine to the North Sea. The Middle Rhine valley lies between Bingen and Koblenz, and due to its uniqueness has been included in UNESCO's World Heritage list. Worldwide, it is an exceptional example of an ancient cultural landscape, where you can experience art and history closely linked with the spiritual, artistic and literary life of Europe, as well as the close interaction between humans and nature with every step you take. The above picture was taken on the Elisabethenhöhe high above Bingerbrück. From here you have an impressive view over the Rhine -deeply cut into the low mountain ranges of the Rhineland-, the Mäuseturm (=mice tower) far downstream in the middle of the Rhine, the Nahe mouth, the town Bingen with the fortress Klopp and the former monastery Rupertsberg owned by Hildegard of Bingen, as well as the massive block of the Rochus mountain on the opposite side with the chapel of St. Rochus. The annual celebration of Saint Rochus held here is mentioned by Goethe.